Dumplings made with lentils and spices, known as Wadi or Mungodi in North India, have many variations in Indian cuisine – specific to state, region or even family. They are often dried and preserved to be used in vegetables, dals and even pulavs. This recipe, shared by Pushpaji Deshmukh, a Maharasthrian great-granny from Mumbai, uses fresh steamed dumplings or wadis made with besan and spices. These are then tossed into a gravy made with talela vaatan, which means a fried paste in Marathi! 1. To make the wadi, mix all the ingredients with ¾ cup water. Steam this mixture for 15-20 minutes by pouring into a plate or dhokla moulds greased with a little oil. The height of the poured batter should be less than ½ inch. Insert the edge of a knife into the steamed mixture to check if it’s ready. If the mixture does not stick to the knife, it is done. Otherwise, allow to cook for a few more minutes. Cool and cut into 1-inch squares. Set aside. 2. To prepare the fried paste known as talela vaatan, popular in Maharashtrian cuisine, saute half the chopped onions in 1 tsp hot oil until they turn translucent. 3. Add coconut and continue to saute until light golden. Grind with a little water into a thick paste. Set aside. 4. Grind the ginger, garlic and coriander leaves with very little water into a paste. 5. Heat 1 tbsp oil in a wok and add mustard. As it starts spluttering, add cumin, asafoetida and curry leaves. 6. Add the remaining chopped onions and saute until they turn translucent. Add the ginger-garlic-coriander paste and saute for 2-3 minutes. 7. Add the fried paste of onions and coconut and saute for 2-3 minutes. Then add the remaining spices and two cups of water. Bring to a boil. 8. Just before serving, add the wadi and bring to a boil. Garnish with coriander leaves and serve hot as an accompaniment to steamed rice. 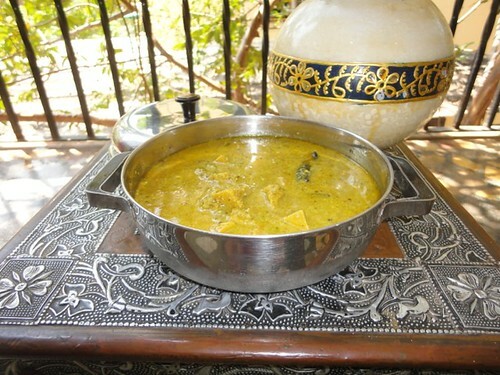 Pushpaji says that wadis must be added just before serving since re-boiling the wadi tends to dissolve them in the gravy. If you do not have kokum, you can substitute it with tamarind paste. This recipe was first published in The Great Granny Diaries – a column in Harmony Magazine. Part-1 of this post is the interview with Pushpa Deshmukh, a Maharashtrian from Mumbai.